Someone keyed my car the other day and it sent me into a bit of a downward spiral. Who knows why people do these things – stupidity, boredom, sheer bloody mindedness. This exhibition brought me back from that space to a rejoicing in human creativity and connection. It helped me leave my troubles behind. The stories in these paintings ground you, bring you back to earth through the experience and feeling of colour, movement and stillness. I, we, cannot understand this ancient culture for it is foreign to us. We are not of it. But we can feel the stories in our own way. While we can’t understand every nuance of symbology and traditional narrative that the paintings contain they can speak to us all as human; we all come from this earth and must return to it. I felt the place from which they emanate, an intimacy with earth, self and soul. I might not know much about anything, about understanding the vagaries of human beings, but I do know what is honest and truthful, has feeling for the piquancy of life. These paintings let my troubles and vicissitudes drop away and uplifted my spirit. Surrounded by love, by colour, by belonging to earth, sky, water, spirit. A wonderful gift to any human being and a wonderful gift from the Felton Bequest to the National Gallery of Victoria and to all the people of Australia. Go and experience their embrace. The artists who collaborated on this work (above) live at Punmu community, on the shore of a vast salt lake, (Lake Dora), which is surrounded by a scattered array of water sources. The artists from this region are profoundly affectionate and respectful towards the salt lake and the fresh waters hat have sustained htem and their families for as long as memory can stretch. The women have reproduced the feeling of the salt lake viscerally: their work conveys its immense scale, fine texture, extreme whiteness and shimmering light. Today, 24 May 2011, the National Gallery of Victoria celebrates its 150th birthday. To honour this tremendous milestone, the NGV today unveiled an exceptional gift of 173 important Indigenous works of art including three by contemporary artists Vernon Ah Kee, Brook Andrew and Jonathan Jones who were commissioned to create works that pay homage to the highly celebrated Wurundjeri artist, William Barak. These pieces have been gifted by the Felton Bequest, established in 1904 by the NGV’s greatest benefactor, Alfred Felton. The Honourable Alex Chernov, AO, QC, Governor of Victoria and Mrs Elizabeth Chernov were present at the NGV’s unveiling ceremony. 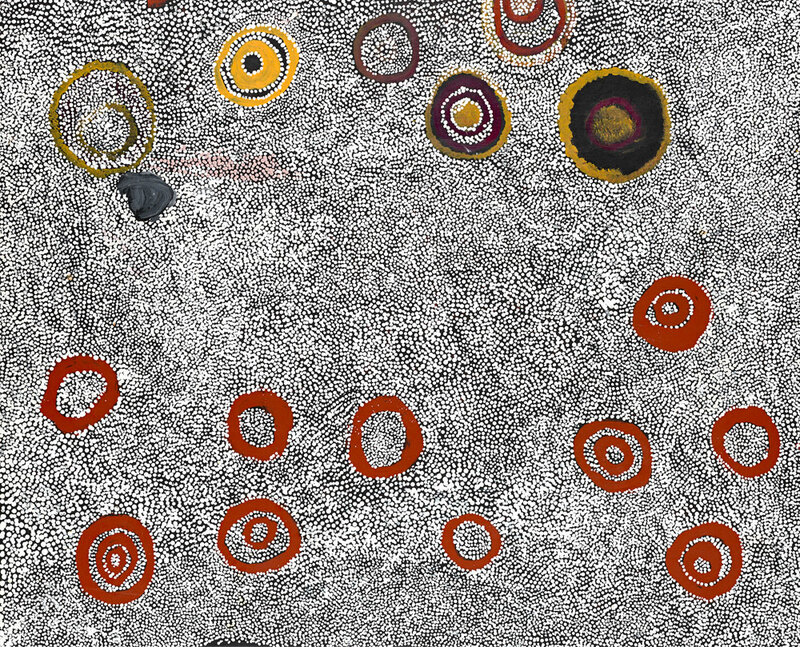 The gift of 173 works encompasses two exceptional collections: the first comprises 63 nineteenth and early twentieth century shields on display as part of the Australian Art collection, and the second 107 twenty-first century paintings from the Far Western Desert, forming the new exhibition Living Water. Dr Vaughan said: “This outstanding gift adds tremendous strength to the NGV’s collection of Indigenous Art. Since the NGV first collected Indigenous art, the collection has grown to hold over 3,000 works representing cultures across Australia. These exciting and dynamic acquisitions will enable the NGV to continue to educate visitors of all ages about the visual art of Indigenous Australians. This gift is a highlight of the NGV’s 150th anniversary year, reminding us of the crucial and continuing role the NGV has played in collecting and displaying the finest art works that can be acquired. The Barak Commissions pay tribute to one of the most important figures of nineteenth century Australian Indigenous art, acknowledging Barak’s central place in the history of Victoria and the NGV,” said Dr Vaughan. William Barak was born in country of the Wurundjeri people and became a leading Indigenous artist and figure in Melbourne during the 19th century. He is said to have witnessed John Batman ‘purchase’ Melbourne in 1835. The multi-media installation by Vernon Ah Kee presents conversations between prominent Indigenous people as they reflect on how Barak has inspired them. Brook Andrew, renowned for his multi-disciplinary works, has created a powerful installation which adorns the entrance atrium at The Ian Potter Centre: NGV Australia. Jonathan Jones, who works with fluid and dancing light as a metaphor of living culture, has created five light boxes that map important cultural designs belonging to Barak as a way of honouring Barak’s life. The collection of 63 rare and stunningly beautiful 19th and early 20th century shields is largely contemporary with Barak’s life. The shields serve to remind us of the time when the plains of Southeast Australia contained carved trees bearing elegant inscriptions, with people dressed in possum-skin cloaks and carrying elaborate shields living extraordinary living in harmony with country and ancient beliefs. 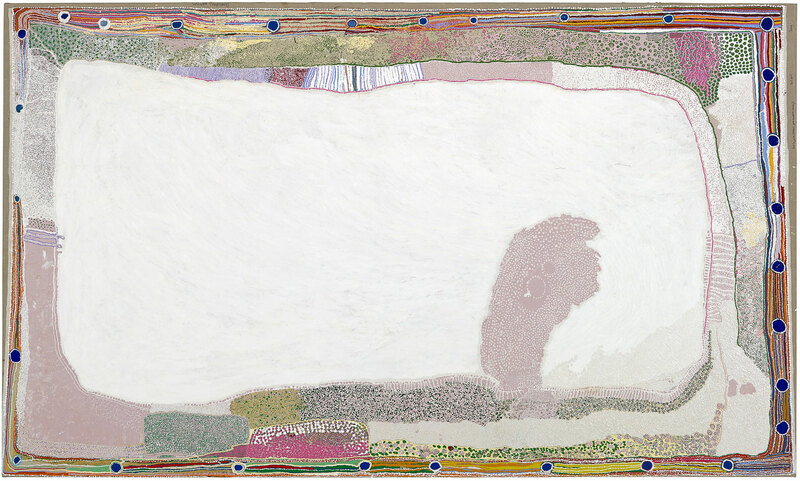 The Living Water exhibition unveils the Felton Bequest gift paintings: 107 adventurous works by male and female artists from newly established art centres in the Far Western Desert, an area stretching across far flung parts of Western Australia and South Australia. The country of the Spinifex people, who speak a southern dialect of Pitjantjatjara language, consists of vast plains of deep red sand, salt lakes and Spinifex. 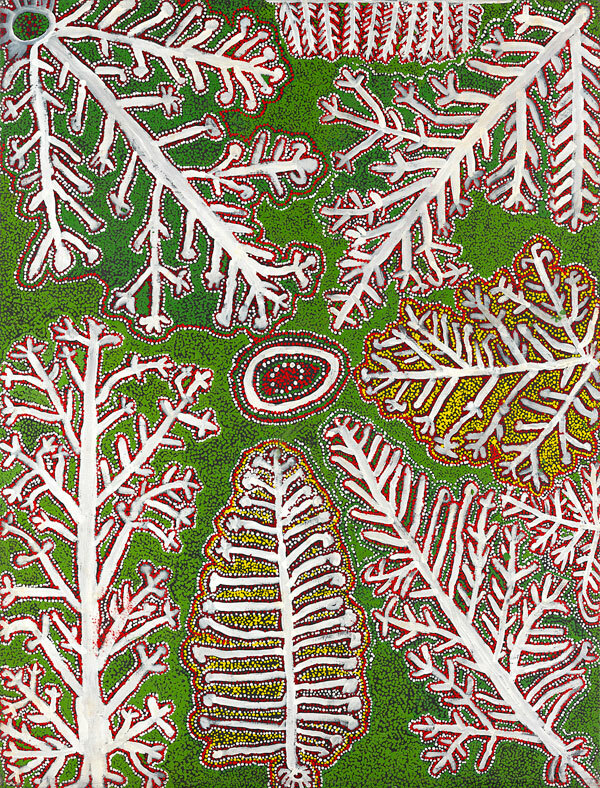 In 1998 the community produced a series of ten large paintings that were bequeathed to the people of Western Australia in a symbolic reciprocal exchange of paintings for land. 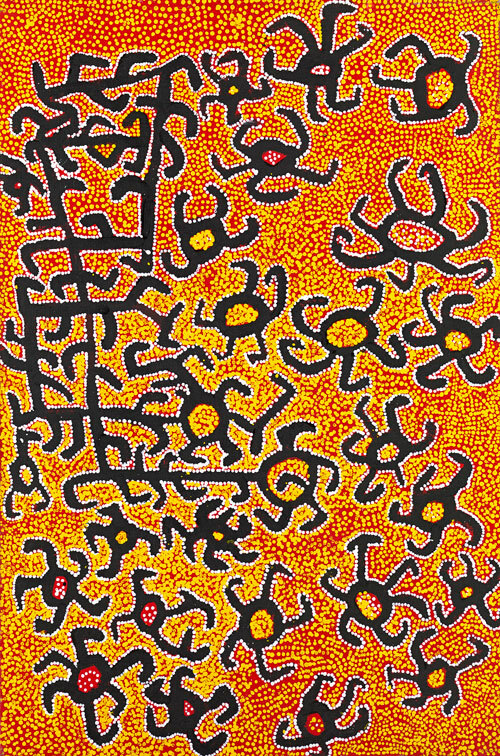 Most Spinifex works, subsequently produced on infrequent painting trips back to country operate as complex maps as well as religious landscapes that detail sources of spiritual power in country belonging to individual artists. 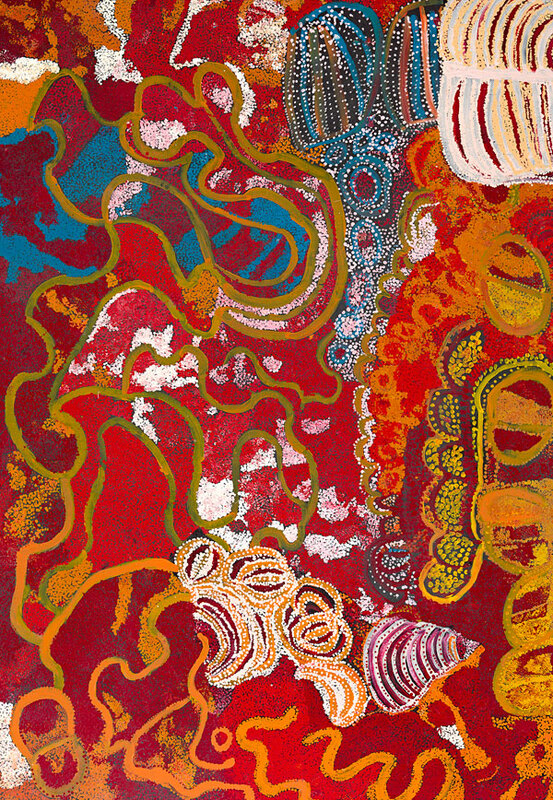 “Living Water, an exhibition showcasing 107 contemporary Indigenous paintings by 94 artists from the Felton Bequest Gift, displays works by male and female artists from the Far Western Desert, an area stretching across parts of Western Australia, South Australia and the Northern Territory. 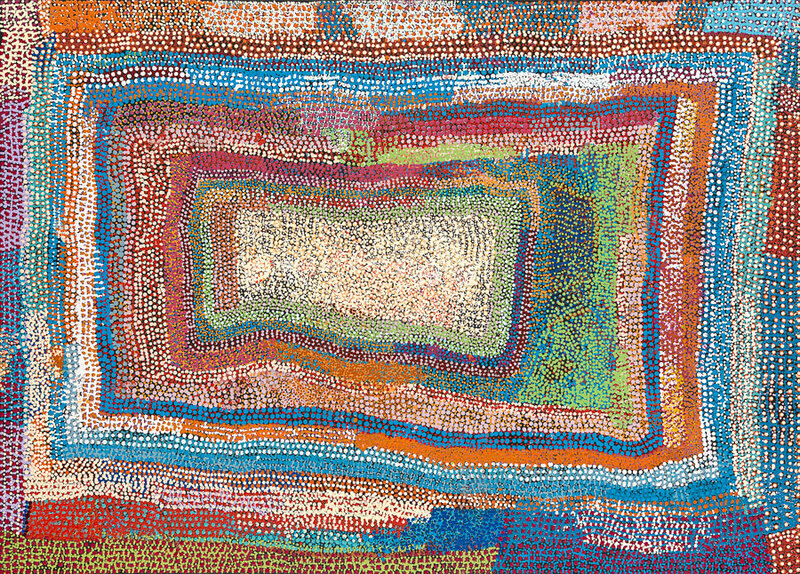 A modern art movement originated at Papunya in 1971, which has since transformed the way we see the land and the history of art in Australia. 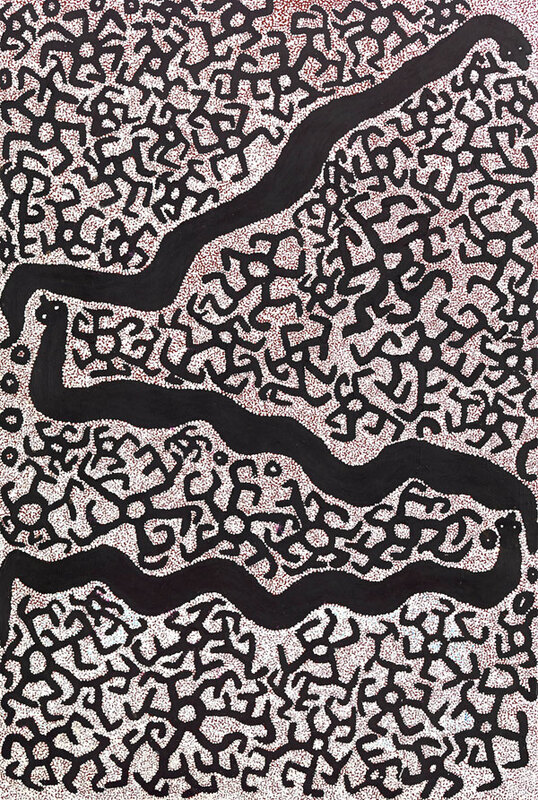 Almost forty years after the genesis of the Western Desert art movement, its epicentre has dramatically shifted from Papunya in the Northern Territory to the Pintupi homelands of Kintore and Kiwirrkura in the Gibson Desert, and to communities that lie hundreds of kilometres to the south and west in far-flung reaches of South Australia and Western Australia (the Far Western Desert). 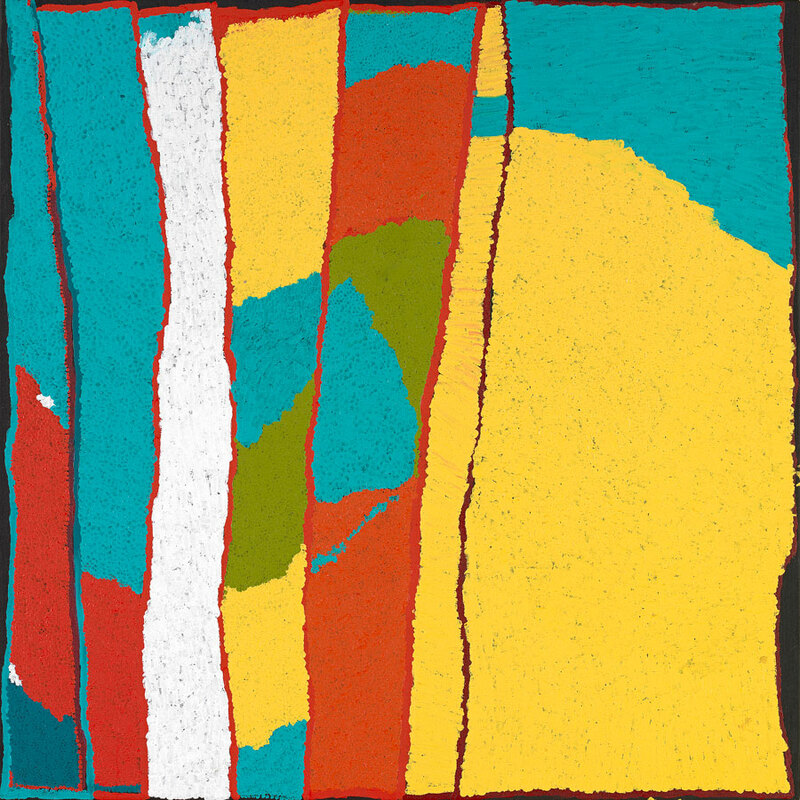 During the first decade of the 21st century, Pintupi, Spinifex, Anangu, Yulparija and Martu artists have developed a dynamic and fresh expression of Western Desert Art. The male and female artists not only share close kinship, social, linguistic and ritual interconnections and lived experience of desert country built up during pujiman (nomadic, bush) days but also have parallel experiences of making art with introduced materials for the commercial market. Their paintings – bearers of sanctity – resonate with the shock of the ancient made new and tell tjukurrpa (stories) associated with special places in their ngurra (country).This dramatic new wave of acrylic painting is the focus of Living Water, comprising the NGV’s 150th anniversary gift from the Felton Bequest of 107 paintings. Aboriginal people from across the Western Desert use the term ‘living water’ to describe water sources, including rock holes and soakage waters that are fed by underground springs. The path of these springs was created by the ancestral beings of the Tjukurrpa (Dreaming) as they themselves journeyed underground, their entry into the earth often marking the site of current day water sources. ‘Living water’ is revered also because it does not seem to be affected by the harsh conditions above the ground that the people themselves have to endure. This exhibition has been curated by Judith Ryan, Indigenous Art Curator, NGV. The following groups of people are represented in this spectacular exhibition. Pintupi is the name of a Western Desert language spoken by Aboriginal people who belong to a large stretch of country in the Gibson Desert of Western Australia and the western edge of the Northern Territory. When the Pintupi arrived in the government settlements east of their traditional lands between the 1930s and the 1950s, they adopted the term ‘Pintupi’ to distinguish themselves amongst the surrounding Aboriginal inhabitants as the ‘people from the west’. 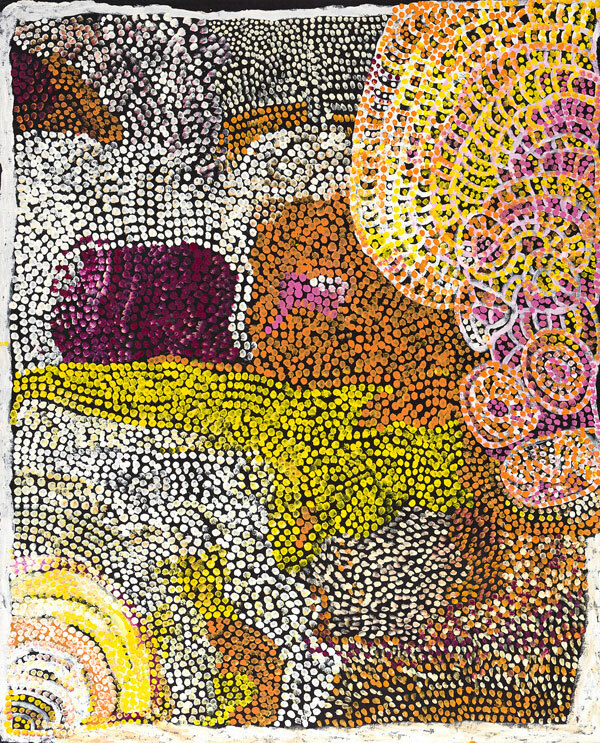 The Pintupi’s complex relationship to the land of their ancestors is expressed through stories, songs and ritual practice that are also depicted in the acrylic paintings of the artists from the Pintupi communities of Walungurru and Kiwirrkura. The Ngaanyatjarra, Pitjantjatjara and Yankunytjara people of the tri-state region of the Western Desert constantly interact and are related by kinship, language and genealogy. Here they specialised in making walka (drawings), batik, punu (wood carvings) and tjanpi weavings, avoiding painting on canvas for the art market until the 21st century because of their suspicion of earlier forms of Western Desert art and their reluctance to disclose sacred elements of men’s and women’s law. The Yulparija people originally come from the Great Sandy Desert of Western Australia, which runs from Telfer in the south to Walungurru in the east and close to Fitzroy Crossing in the north. 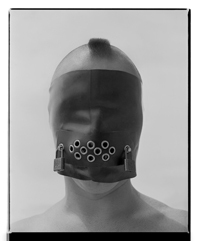 Their work contains deep threads of cultural memory and is daring in its vigour of application and iridescent palette. The Yulparija have forged a painting style that combines their cultural memory of desert birth country with the rich blues and greens of saltwater terrain. Martu means ‘one of us’, or ‘person’ and is the word chosen to represent a number of different language groups from country across the Great Sandy, Little Sandy and Gibson Deserts of the Pilbara region of Western Australia.